Yes, it is Saturday and it was the day to sleep in. However, I woke up early, went for a walk around the hotel, and then took a morning nap. Then in the afternoon, I walked a mile over to Subway for lunch to eat the familiar. On the way, hawkers were selling fruits including mangosteen and the king of fruits called durian. Durian is not allowed in hotels as it has a distinctly unpleasant smell for most. 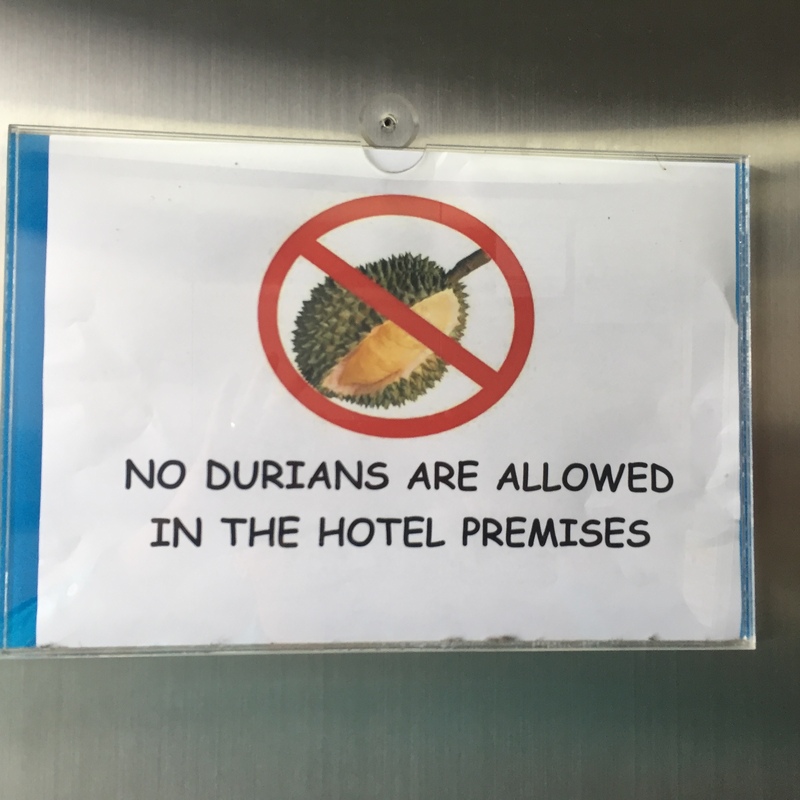 Photo: A notice in hotel elevator about the durian fruit. 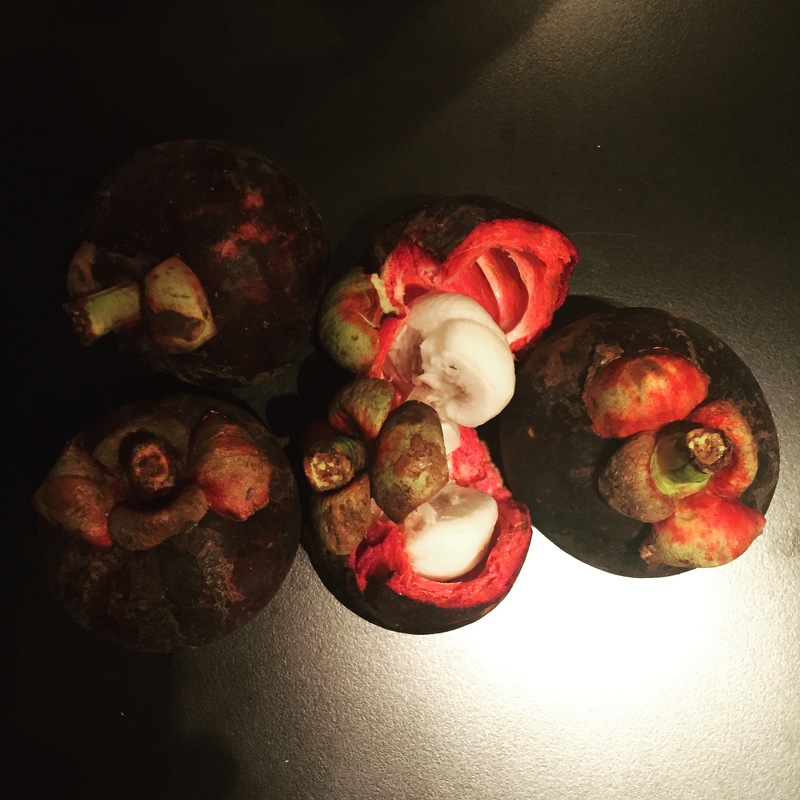 Photo: The mangosteen fruit – tastes like lychee. I spent the rest of the afternoon reviewing the back-to-back workshops I was facilitating Monday thru Wednesday. I spent the early morning time before that on replying to some work emails and reviewing for the upcoming workshops. My host invited me for lunch and it included a mango shake, curried shrimp, chicken curry, sambar, rice, and yogurt. I thanked my host and his spouse for making me feel at home. 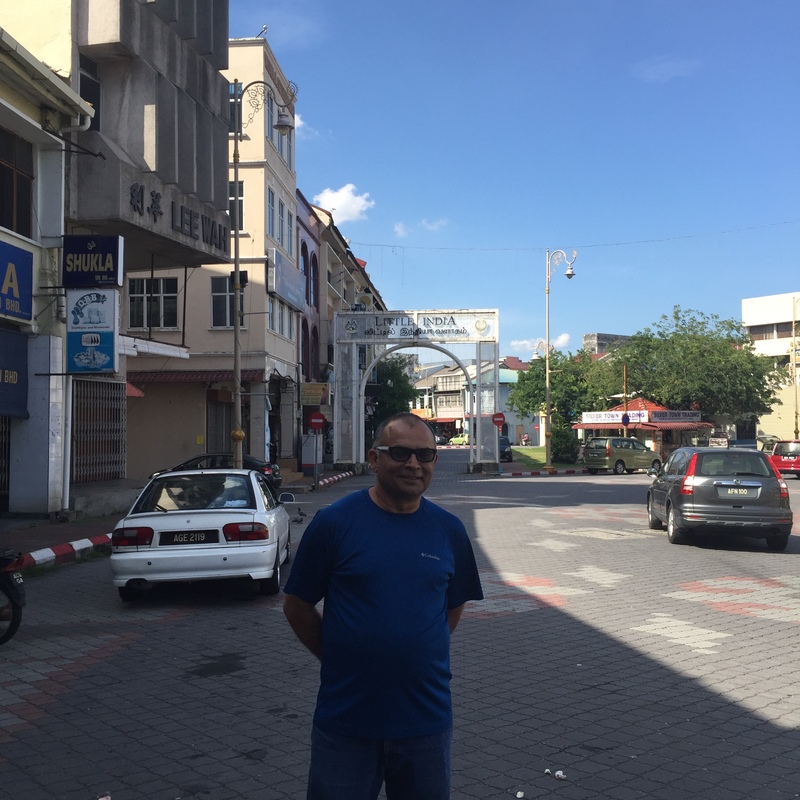 My host then took me to the capital city of the state of Perak named Ipoh for a tour. Ipoh is the second biggest city of Malaysia. Of course, like any other major city, there is a place called Little India. The place is lined with Indian shops. 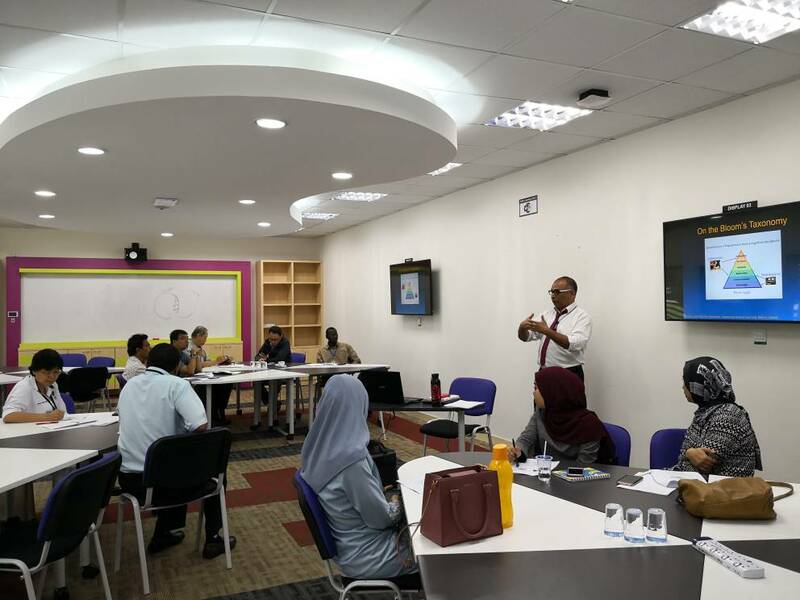 We returned to Seri Iskandar for me to take some rest and give some final touches to the Monday’s scholarship of teaching and learning workshop. Photo: At Little India, Ipoh, Malaysia (Courtesy: Dr. Srinavasa Rao). Today is the last day of the first week of my visit. I had a free morning and used it to review the upcoming afternoon session on accreditation and curriculum. 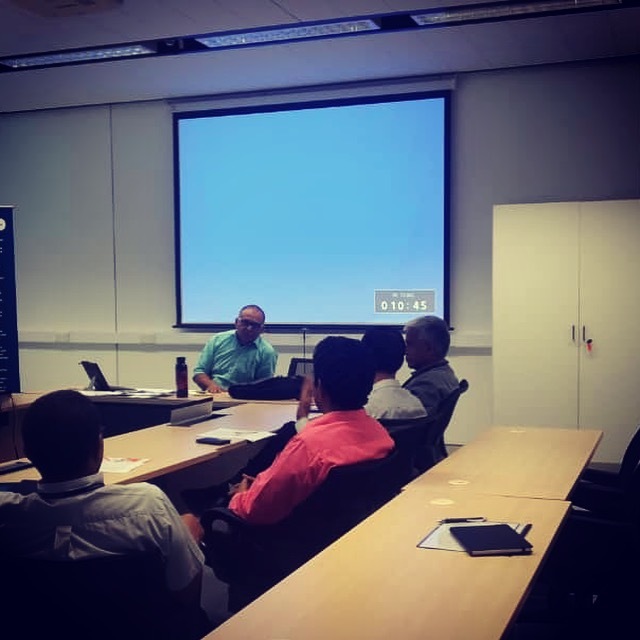 In the afternoon, we had a listening and discussion session with the mechanical engineering faculty about accreditation items, mostly on five topics – ethics, continuous quality improvement, lifelong learning, oral and written communication, and teamwork. We exchanged ideas about these topics on how to implement and evaluate these topics in the classroom. The idea that although we teach ethics and students may not follow those standards in the university are universal ones. I believe that we still need to meet the minimum standards of teaching ethics, give examples, and let our students reflect on case studies. Photo: A sharing session with the department of mechanical engineering faculty of UTP, Malaysia. In the evening, there was an after-Eid celebration at the university. Families of staff and faculty were invited to an evening of music and food. I tried several different foods including tomato rice, curried chicken, shrimp fritters, and fruit salad with local fruits. I met several faculty members from other departments and we shared our common interest in improving teaching and hence student learning. I also met an instructor of Numerical Methods, a course I teach every semester as well. He was already aware of the open courseware we have developed. My host picked me up early to meet with the department chair. She welcomed me to UTP and I was given a nice vacant office. I set up my Surface Pro and it connected seamlessly to the university guest network. I replied to some work emails, called my spouse, and started doing final preparations for the afternoon short course on Introduction to Composite Materials. Course Description: This would be a six-period course of 50 minutes each where the mechanics of composite materials is presented. Because of the limitation of six-period time, we will concentrate on a short introduction to composites (2 periods), and macromechanics of a lamina (4 periods). More than 25 graduate students from various engineering disciplines showed up. Along with the domestic students, there were international students from Nigeria, Pakistan, India, and Indonesia. I presented an overview of composite materials including classification, history, applications, manufacturing, advantages, and drawbacks, etc. We also went through a concept inventory of the background materials from the mechanics of materials course. The results and ensuing discussion was quite revealing to them as well as me, and the misconceptions were similar to what I observed back in the USA. It confirmed to me that learning in higher education has room for improvement throughout the world. At the end of today’s class, several students talked to me at length about their research projects in areas such as welding, plates and shell mechanics, and nanocomposites. They also liked the interactivity of the class and I was glad to see them staying engaged for three hours (yes, we did take a short break in between). 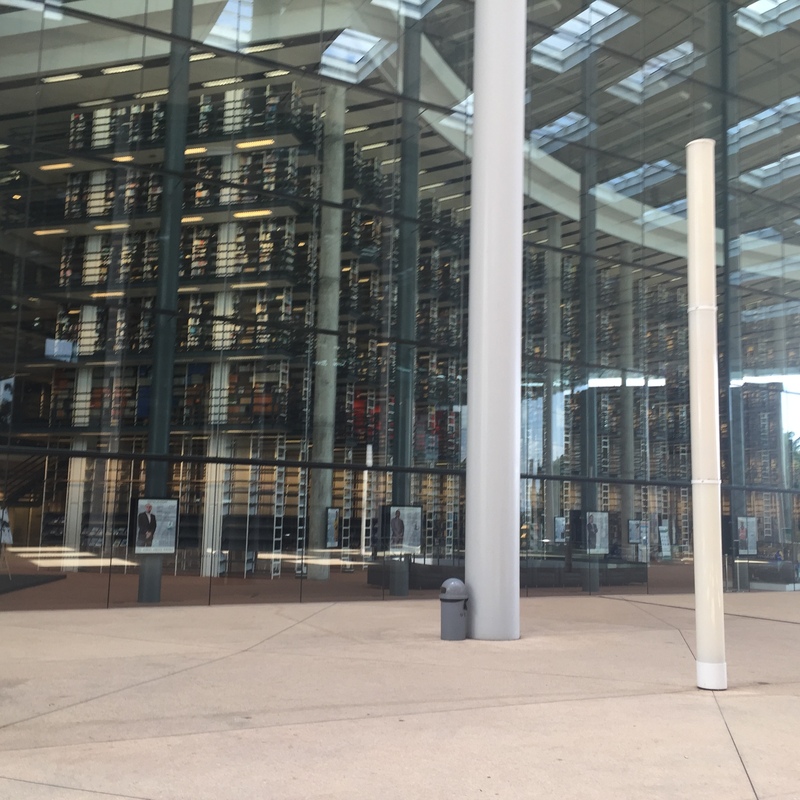 I am writing this blog for each day of a Fulbright Specialist program I participated in to visit my host institution of UTP Malaysia. The trip lasted 18 days (July 8-July 25) and that included travel time. “The Fulbright Specialist Program is a unique opportunity for U.S. academics and established professionals to engage in two- to six-week, project-based exchanges at host institutions across the globe.” Read more about the program. Photo: The Chancellor’s building at UTP, Malaysia. The opportunity arose when a professor of mechanical engineering, Dr. Srinavasa Rao of UTP Malaysia was visiting Tampa in 2017 for the annual international conference of the American Society of Mechanical Engineers. I told him about the program when he mentioned his institution’s high interest in engineering education. Eight months later, after he had made an application to the program at the Malaysian embassy as a host institution and had arranged university funds for host-institution responsibility (boarding, lodging, and local transportation), I was ready for this endeavor. 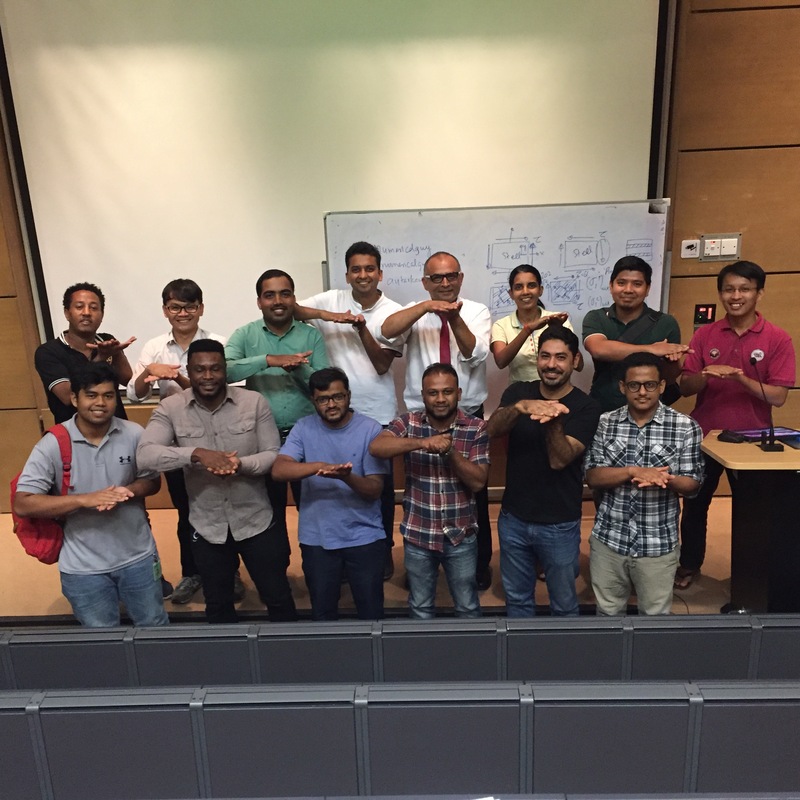 My task was to facilitate four workshops on engineering education, give guest lectures and conduct tutorials in my favorite course of Numerical Methods, teach a short course on Mechanics of Composite Materials, meet with individual faculty and administration, and create a plan for the future exchange of students and faculty between UTP and USF. Getting up at 3AM to go on a flight time of 27 hours and a travel time of 36 hours is not very many people look forward to, but they sure look forward to what they will do at the destination. The flight took me from my home city of Tampa, FL to Dallas, TX to Hong Kong City and finally to Kuala Lumpur, Malaysia. After a 2-hour flight delay in the last leg of the flight, I reached Kuala Lumpur next day at midnight. It is late in the night of July 9 and I am here at the Kuala Lumpur airport going through immigration, customs, and baggage claim. My host, Professor Rao has traveled all the way from Seri Iskandar, Perak to take me back to UTP. However, since it was late, we spent the night in Kuala Lumpur. It was later than 2:30am that we reached the hotel. The hotel was right across the Twin Towers of Petronas and I had a partial view of it from my hotel window. I could not sleep as I either had jet lag or had my share of the Z’s on the plane rides. A 12-hour time difference and jet lag work well if one wants to talk to their loved ones back in the USA. The previous day entry of this blog was that of the wee morning hours of July 10 but who is counting with the jet lag and the time difference of exactly 12 hours. 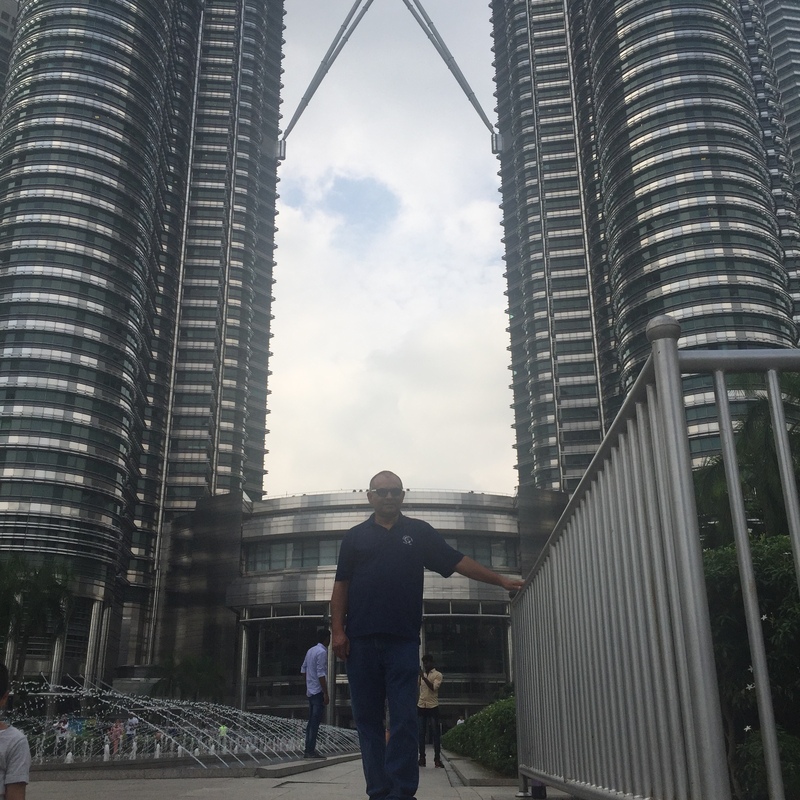 Before leaving for Seri Iskandar, my host and I walked across the street for a morning walk to see the Twin Towers. With a few pictures and some selfies, it was nice to see this engineering marvel of the tallest twin towers in the world. The towers looked exquisite and the architectural design, at least to me, was very pleasing to the eye. 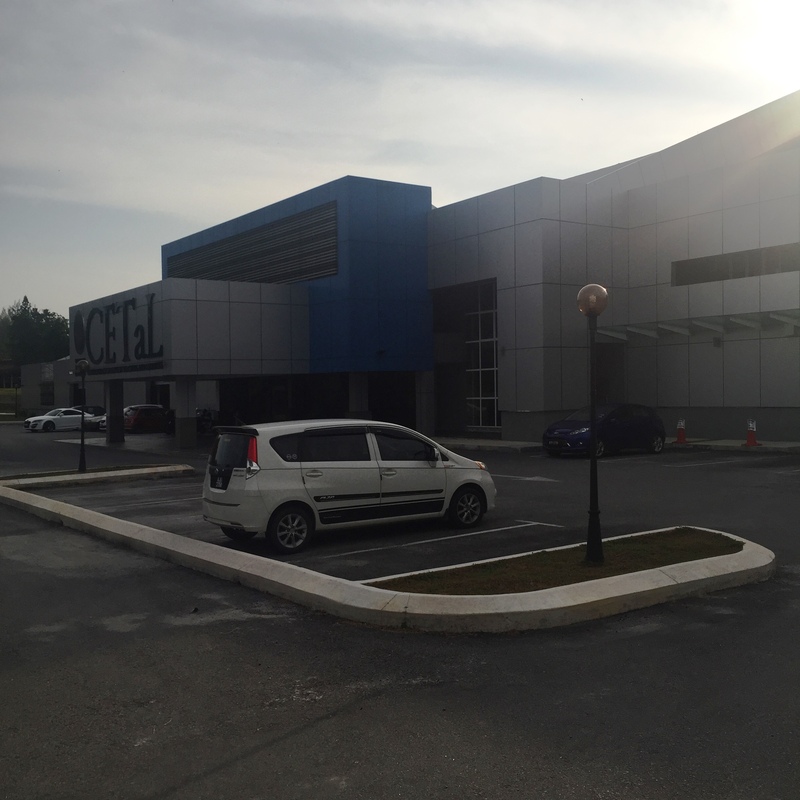 The ride to Seri Iskandar, the hometown of UTP, was little in getting out of the traffic jams of Kuala Lumpur but mostly on a well-built highway E1 that runs north-south between the border with Singapore on the south and Thailand on the north. The highway is a pleasure to drive with greenery and hills all around you. The highway is full of palm trees – no wonder they produce so much palm oil. Yes, they do drive on the left and it does take a little to get used to it. 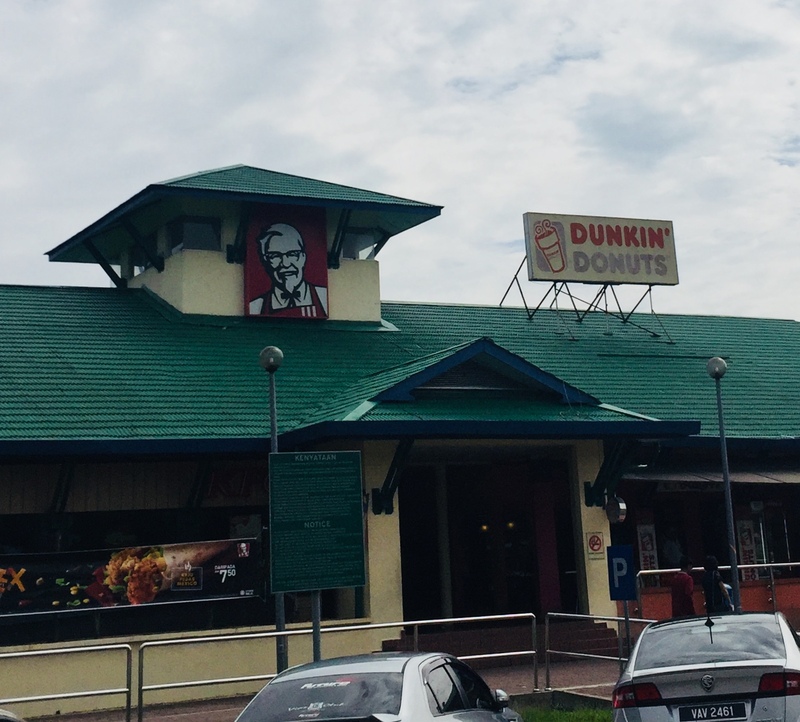 We stopped at a traveler’s stop close to Tapah and guess what two fast food places are there – KFC and Dunkin Donuts. There were a few other choices but to avoid any sudden food changes, my host recommends KFC. It was a good choice – they serve the chicken with rice and coleslaw. We reached the hotel at about 4PM. The receptionist gave me coupons for breakfast and a print out of how to access the internet. You get 500MB of data on two devices for each day and you have to get new usernames and passwords at the front desk every day. The network speeds are meager – two Mb/s for upload and download but they are sufficient for my work – there is no need to be watching Netflix or YouTube even during personal time. I checked into the room. It is spacious, the bed is comfortable and there is a rain shower in the bathroom. There are no closets in the room but there is enough cubbyhole space to put your clothes and belongings for an extended stay. A working desk with chair is also available, and the room has a refrigerator and a safe. There are a generous number of outlets throughout the room. It is time to call my mom in India first and later my spouse. I love them both and the reason I called my Mom first was that the time difference was more favorable!